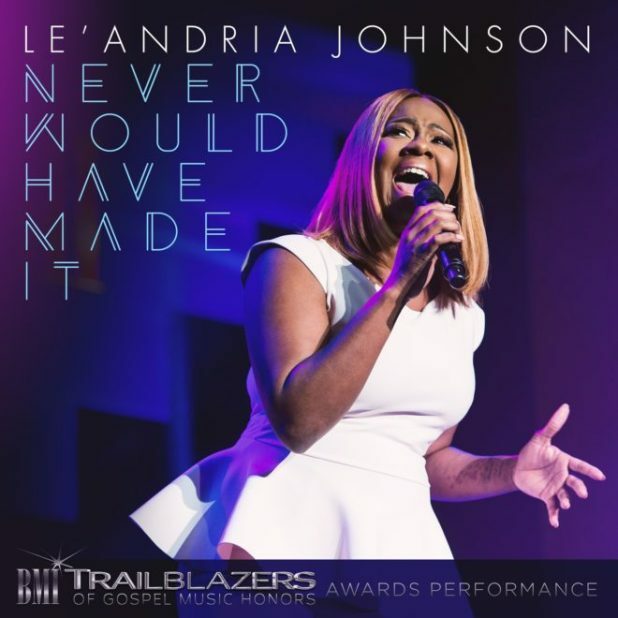 Following Le’Andria Johnson’s live appearances this year performing on the Trumpet Awards and the 2017 BMI Trailblazers of Gospel Music Honors, her incredible performance of “Never Would Have Made It” gives fans a taste of the amazing vocals and inspiring freshness she continues to bring in her distinctive style, with more new music on the way from Johnson soon. NASHVILLE, TN – February 24, 2017 – GRAMMY®– winning artist Le’Andria Johnson delivers a hit live performance of Marvin Sapp’s signature smash hit “Never Would Have Made It”, available on VEVO and digital providers now. Singing an acclaimed tribute to honoree Sapp at the 2017 BMI Trailblazers of Gospel Music Honors, Johnson’s 10-minute rendition of the beloved classic brought the crowd to its feet, and has become a quick hit among fans, generating over 162,000 views and counting of her performance on the VEVO video.